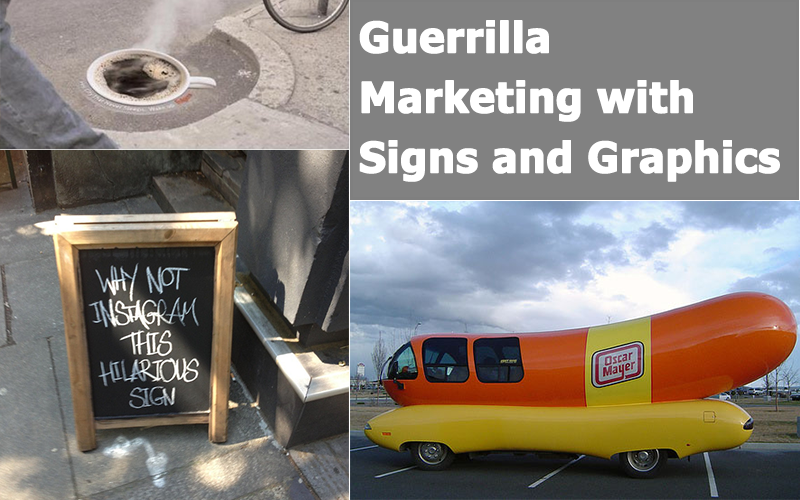 Guerrilla marketing is a term that’s used to refer to surprising and unusual ways of bringing attention to your business. It can come in all different forms, including viral videos and street campaigns that make passersby do double takes. While a lot of viral marketing takes place online, the streets are still the target of good guerrilla marketing, and can benefit from creative graphics and signs. Companies with big budgets have taken up the normally budget-friendly manner of marketing in big, expensive ways. 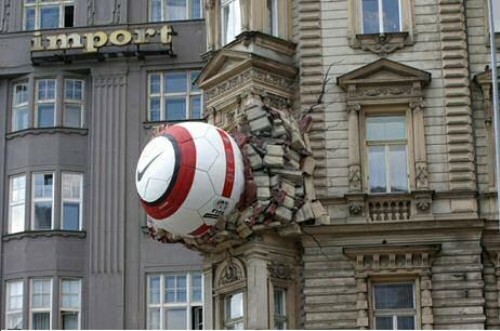 Nike created a giant soccer ball, and then made it look as if it were crashed into the side of a building. As one of the least expensive options, chalkboard signs end up being some of the most memorable signs of all. You can personalize messages, change them whenever you’d like and add artistic flair in a simple, easy way. 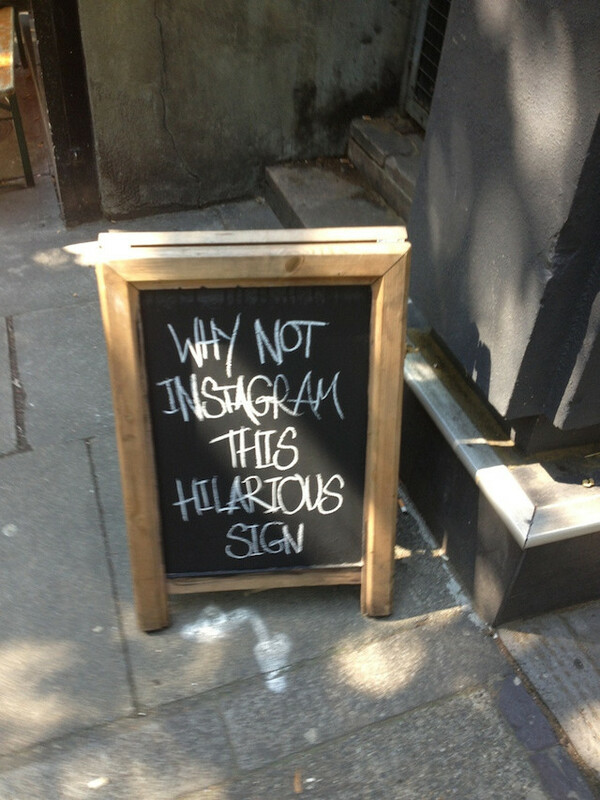 As an added bonus, your sign is likely to be captured by someone’s camera phone and put on social media by someone who lives locally. When the poster’s local friends see your clever chalkboard sign on Facebook or Instagram, they’re more likely to keep an eye out for your business when they’re traveling in your neck of the woods. Make sure that your message is visible and remember a few key elements when you’re planning the design and where to put your outdoor signs. The things that we see on the street or at work day after day can be slightly modified to make potential customers look at them in a brand new way. 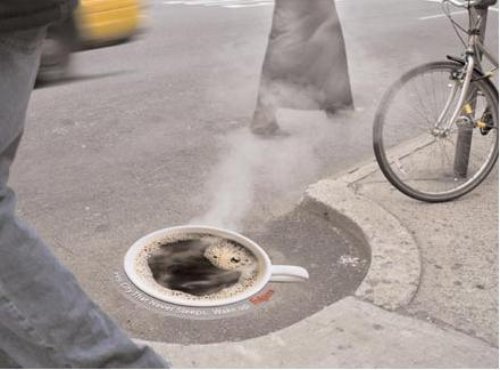 For example, Folger’s Coffee used graphics that looked like full coffee cups to cover manhole covers so that when steam came out of the ground, it would look like a hot cup of java. With the amount that we tout vehicle wraps, we might sound like a broken record, but vehicle graphics really can function as guerrilla marketing if done correctly. 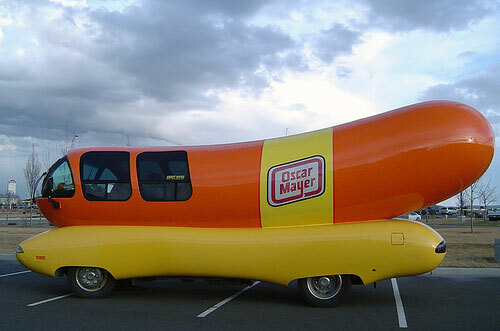 Consider the Oscar Mayer Wiener Mobile: it is instantly recognizable and gets people excited whenever it is in town. If you don’t have the budget to modify the actual bodywork of your car, a creative graphic wrap can do the trick to draw attention and make the most of the inevitable thousands of impressions you’ll make.